Time is extremely valuable to you, and that’s why we have invested in CEREC® digital dentistry. CEREC® is really an advanced state-of-the-art method enabling us to make and put in a natural-looking crown that will fit your teeth flawlessly. And also, to do the full process before your appointment is over It usually takes approximately one hour for the crown to be produced and cemented in position. This procedure would once take a week to 10 days. 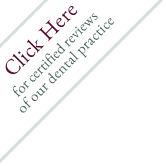 One can find only a handful of dental offices which incorporate this remarkably advanced technology within their dental practice. If you require a crown or an inlay, we will model the brand new restoration with a specialized computer, and create the crown here inside our own lab. Because everything is electronic, we are able to take electronic impressions of your teeth. This means no more gagging on dental goop. The actual digital “impression” taken using a revolutionary 3D scanning system is much more accurate than conventional molds and creates a crown with a far more superior fit. The actual crown is created out of a high-strength ceramic block using a 3D printer. The ceramic that is used creates a stronger and longer-lasting crown in a small fraction of the time. This means you don’t have to drive to visit us again, take a seat in the chair yet again for an hour and then drive back home just as before. You spend less precious time, headache and gasoline!